I saw this recipe over at Crazy for Crust and immediately bookmarked it. I love her blog, she has great recipes and she always makes me laugh with her stories. You should check it out. I had never seen a carrot cake cinnamon roll before but now it inspires me to think of other fun flavors to add to the rolls. I have been seeing a lot of pumpkin cinnamon rolls recipes around lately, that could be a great starting point too. Since it's fall now and most people are wanting comforting and traditionally autumn inspired foods it could be perfect. 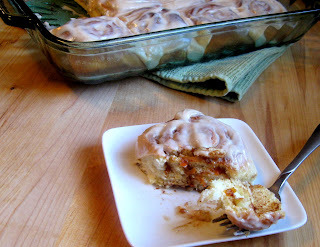 But I would start with these carrot cake cinnamon rolls. One of my favorite parts of cinnamon rolls is the frosting because it's so creamy. Some people use a glaze of powdered sugar and milk, that's alright too, but I would take a cream cheese frosting any day over the simple glaze. This recipe makes 12 but they will be eaten before you know it. Happy Baking! 1. Mix together the yeast and warm milk in a small bowl and let sit until it starts to become foamy, about 5 minutes. 2. In a mixer, blend together the butter, sugar, salt, and egg until blended. Add the yeast mixture and stir. 3. Slowly add the flour ½ cup at a time and mix. Add enough flour to create a soft dough that is barely sticky when you touch it. 4. Place the dough in a large bowl that has been sprayed with non-stick spray and cover with plastic wrap. Let the dough rise 1-2 hours or until doubled in size. You can also let the dough sit in the refrigerator at this point overnight then let it sit on the counter about a half hour in the morning and proceed. 5. Roll out the dough to about ½” thick, then spread with the softened butter. In a small bowl mix together the brown sugar, cinnamon, ginger, carrots, and flour. Sprinkle the carrot mixture evenly over the rolled out dough. 6. Roll up the dough with the long side closest to you. Cut the roll into 12 equal pieces and place in a lightly greased 9”x13” baking dish. Cover the dish with a kitchen towel and let rise for about one hour. 7. Preheat the oven to 400F. Bake the rolls 18-20 minutes or until golden brown on the top. 8. Make the frosting while the rolls are in the oven. Mix together the cream cheese and butter then add the vanilla and cinnamon. Mix in ½ cup of powdered sugar at a time until all of it has been added and beat until smooth. 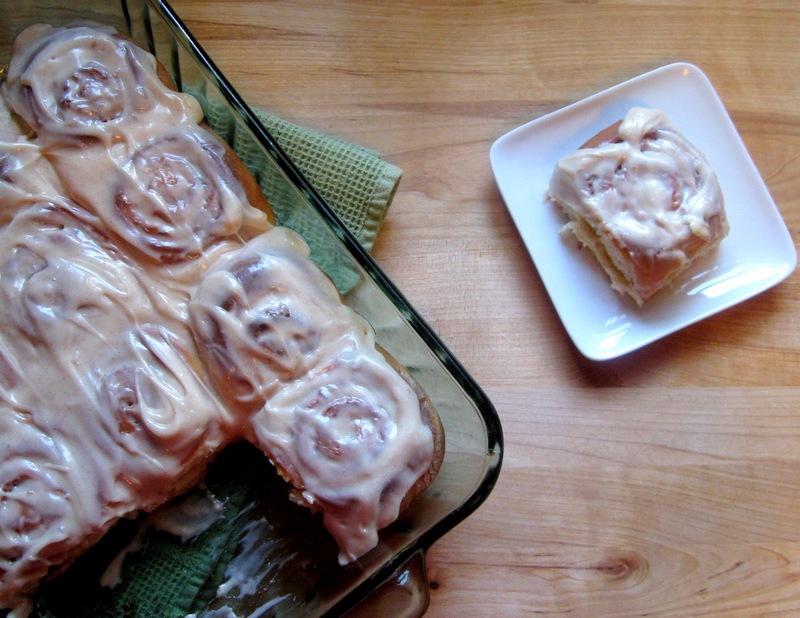 Spread on the warm cinnamon rolls. Yum. I love carrot cake anything.